In this blog post, I discuss my secret Dutch identity and the Dutch speaking dilemma that stems from it. 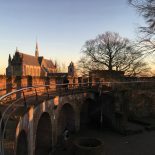 I also hope to introduce you to 25 new The Hague inspired Dutch words, so that you may enhance your own Dutch language learning. The Dutch connection (as I have now coined this brand-meets-global-network) is very real within our globalised world, and the benefits to circulating within this network continue to surprise, the world over. As we are about to raise our final cups of kindness to 2016, I thought it may be fitting to entertain the tradition of past reflection, that of auld lang syne, and to re-cap on some of the lessons and highlights that this year has brought, especially in regard to self-realisation, the maintaining of old friendships and the embracing of change, whilst studying at Leiden University. Targeting Homesickness: managing exam time whilst hankering for home.